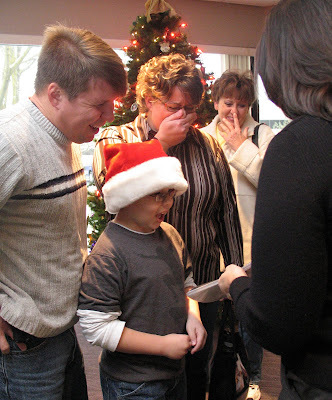 For more than one dad, mom, grandmother and brother - referrals are making this Christmas season bright. Congratulations to eight Ethiopia families! Kevin, Heidi, grandmother, and brother Grant take their first look at their Ethiopia referral, Tuesday, December 16th. After a positive court decision, the 2-month-old boy whose photos elicited tears and awe will have two brothers, Grant, 8, and Garrett, 6. On Tuesday, December 16th, Children's Hope Ethiopia Program received three referrals for our waiting Ethiopia families. Then today, Wednesday, we have received five more! The referrals given on Tuesday were for boys, ages 7 weeks, 2 months and 10 months. These three young infants are from Numan Orphanage. Congratulations to the happy families! The referrals given today were for two boys and three girls. The boys are 2 months and 5 ½ months old; the girls, 2 years, 19 months and 2 months. Two of the children were abandoned and 3 were relinquished by a birth relative. We rejoice today as these children have an opportunity to find a loving, forever family to nurture them as they grow. Congratulations to each of our families! What a great Christmas present! There is a lot to celebrate this week. Children's Hope International's Ethiopia Program is happy to welcome two of our families back from Ethiopia with their children. Congratulations to the families and Merry Christmas! Also we are happy to announce four referrals were received for Ethiopia waiting families this week - two sibling groups. The sibling group referral we received yesterday was for 2 identical 4-year-old twin girls. Today, too, we received a sibling group referral of 2 children, one girl and one boy, ages 1 ½ years and 2 ½ years. Of course the families are overjoyed, and we are overjoyed for them. Congratulations to them all! Children's Hope Recieves Hague Accreditation! We are thrilled to announce Children’s Hope International is Hague Accredited! Thank you for your thoughts and prayers! Our Hague accreditation signifies that CHI meets an international standard of practice based upon a treaty, the Hague Convention on Protection of Children and Cooperation in Respect of Intercountry Adoption. The Hague Convention has been ratified by 2 of the countries Children’s Hope works with for international adoption – China and Colombia (and likely Vietnam when it reopens). The treaty establishes protection for children, birth parents and adoptive parents while it also endorses the concept of international adoption as a means for homeless children to receive permanent, loving families. Join us in celebrating this great news! We will begin accepting applications in China and Colombia, effective immediately. Since 1992, Children's Hope has created forever families for 341 orphaned children from Colombia and 4,036 orphaned children from China. For helpful links and to view our letter of approval visit our Hague Convention web page.